The first time I wrote about Sugarcane Raw Bar Grill, I wrote about their happy hour. This time around I’m going to write about their brunch. A couple of girlfriends and myself headed over on a Sunday afternoon eager to try their tapas style line up. Unlike the hustle and bustle this restaurant has on any given night, the Sunday morning flow is nice and easy coinciding with what a lazy Sunday should be. This restaurant has a completely different vibe during brunch, everything feels laid back and in slow motion. On the other hand, I might’ve still been drunk from the night before, which would explain the slow motion effects. Either way, I liked it. We started off brunch with alcohol, naturally. One of my friends went with the Passion Fruit Bubbles, I had my ever faithful Blackberry Toast and my other friend had their Hibiscus Blossom. The Passion Fruit Bubbles is a wonderful combination of passion fruit juice, strawberries and plum sake. It’s a great, girly and tropical start to any lazy weekend. The flavors in this drink play on your tongue like kids playing hopscotch. My drink, the Blackberry Toast, is a more hearty drink. There’s nothing like starting your day with a little bourbon if you ask me. This is my favorite cocktail at Sugarcane, it’s Jim Beam Bourbon, muddled blackberries, their “secret syrup” and thyme. The last drink of the bunch is a bit more flowery, literally; the Hibiscus Blossom is made from hibiscus infused cachaca, citrus essence and mint. One thing I can say is Sugarcane’s bar is one of the most inventive I’ve seen in a while. Their bar has no qualms with going out on a limb and trying radical new things. Which is one of the reasons why I enjoy this place so much. When it came to the food, we started out with their sweet bread basket. The breads featured in their bread basket change daily and in our basket was zucchini, banana breads and a raspberry/blueberry muffin. 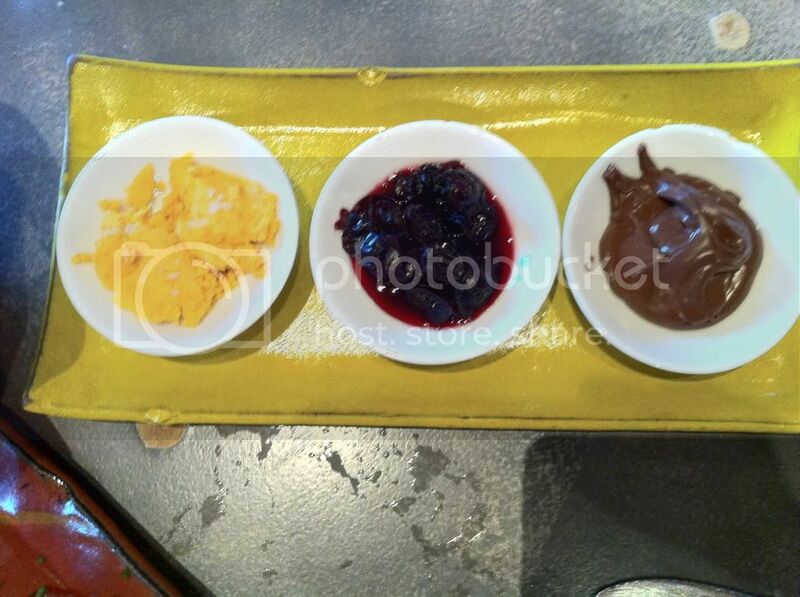 The jams and butters that came along with our bread basket were pumpkin butter, nutella and a fresh made cranberry marmalade. 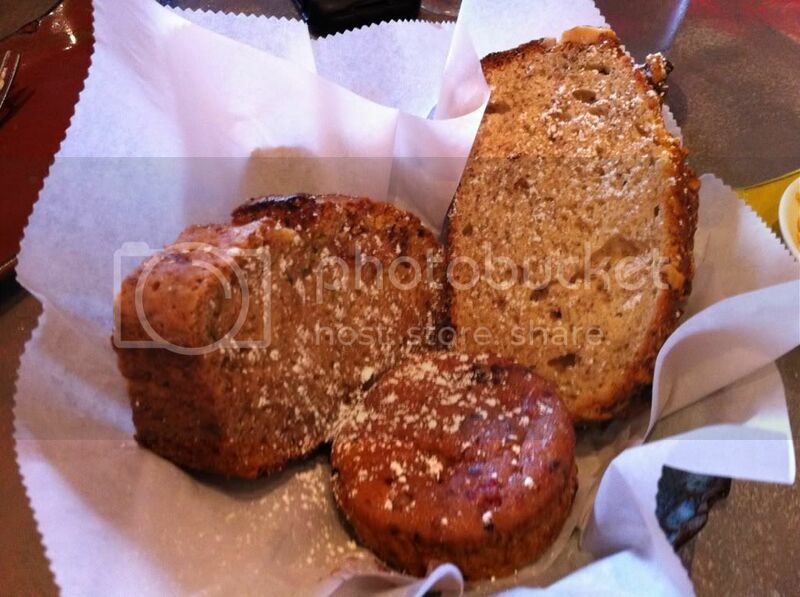 All three of the breads were soft, flavorful and freshly baked. The pumpkin butter, although creative, could have used slightly more pumpkin flavor and seasoning. The nutella was, well it was nutella. It was great but nothing really unique about serving nutella. The cranberry marmalade was by far my favorite with a playful combination of both tart and sweet flavors which went perfectly with the blueberry/raspberry muffin. 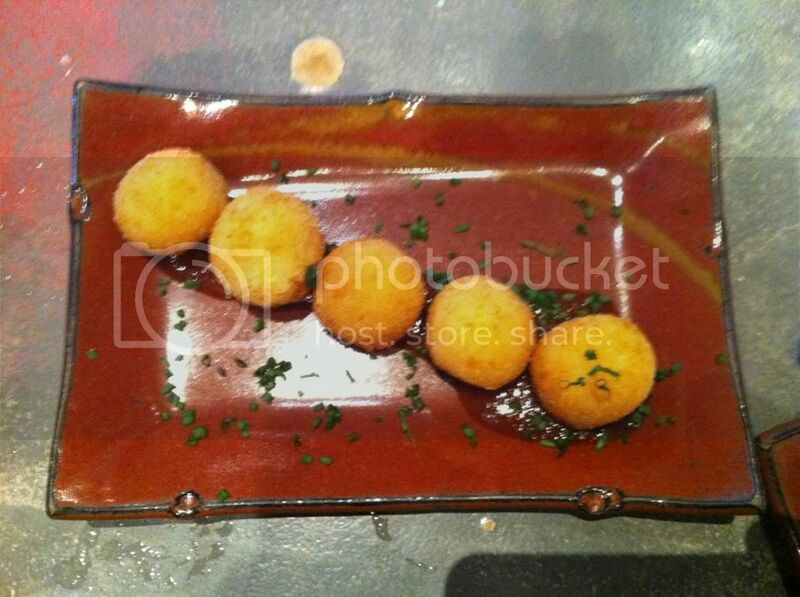 Up next we had their Goat Cheese Croquettes, which are also available on their regular menu. 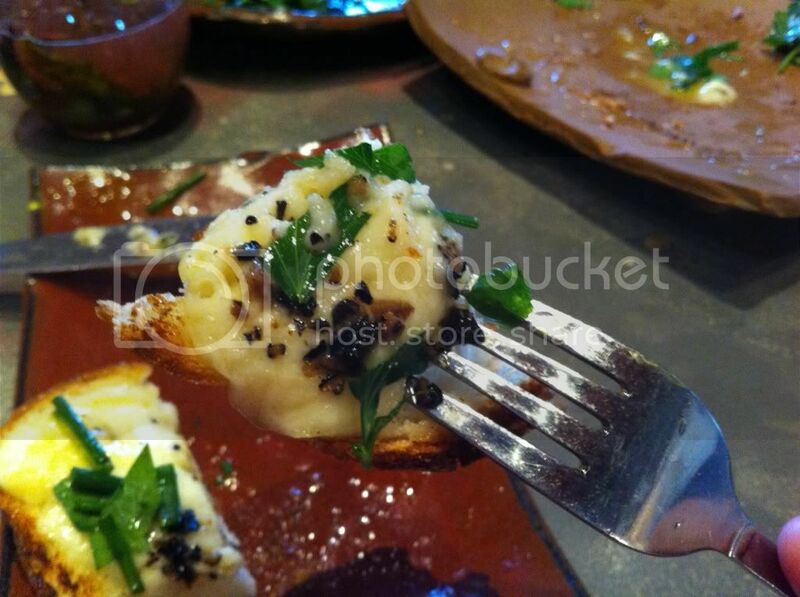 This is one of my ‘old reliable’ dishes at Sugarcane. The sharp taste of the goat cheese is paired well with a sweet membrillo marmalade. 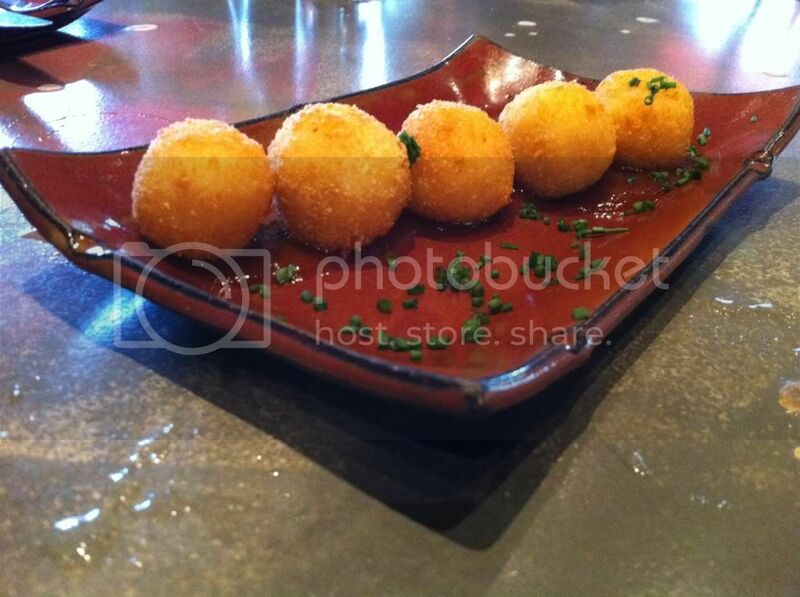 The texture of the soft and warm goat cheese is contrasted nicely by the crispy outside of these piping hot croquettes. We then moved into heavier dishes with the Duck and Waffles. This is Sugarcane’s take on fried chicken and waffles. I personally really liked this. 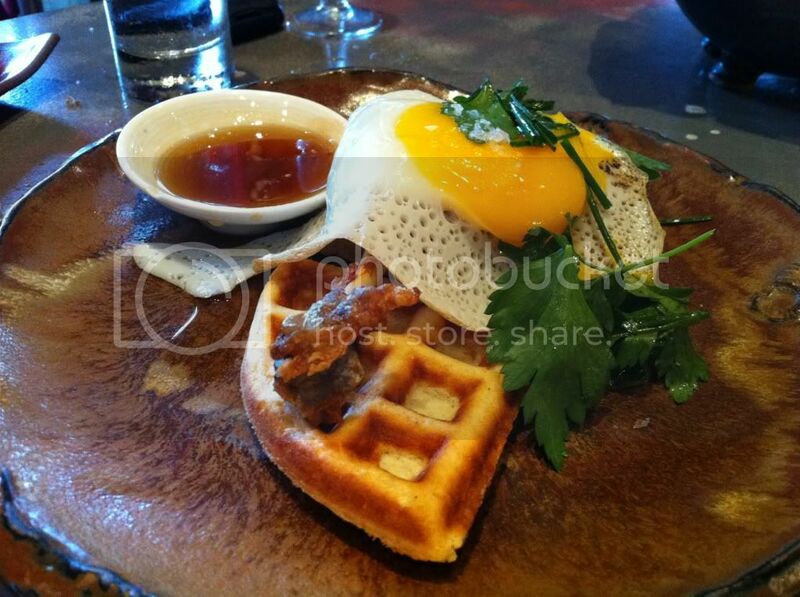 The waffles are piled high with fried, bone-in duck meat and a fried duck egg over the top. There is also a side of mustard maple syrup served along with this dish that compliments it in a flavorful yet subtle way. This definitely isn’t your typical southern chicken and waffles. The seasoning on the duck is slightly more spicy and it went well with the mustard infused maple syrup. 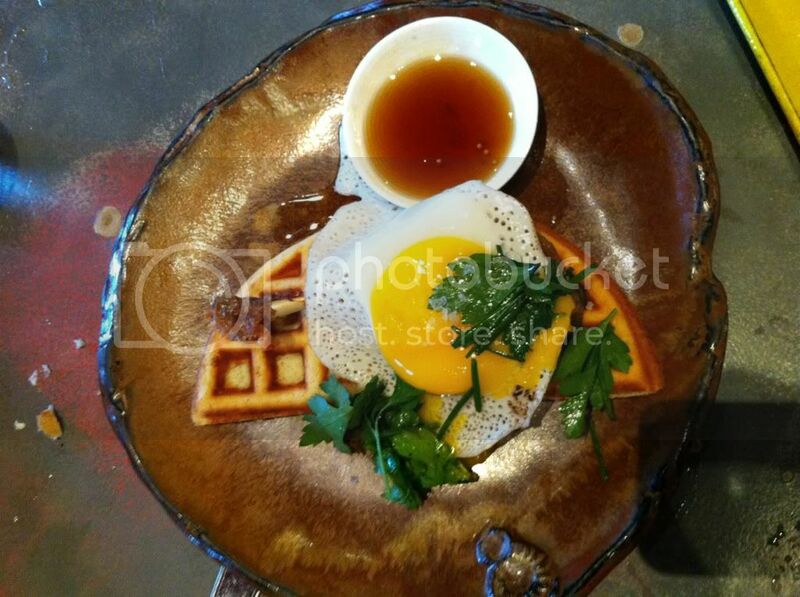 The waffles were soft and warm and did a good job of soaking up the maple syrup and runny yolk from the fried duck egg. My girlfriends and I were all impressed with this dish and the interesting twist Sugarcane brought to this southern staple. After that hearty plate, we moved on to their house made chorizo. This bad boy came out served whole in all of its phallic glory saying, “Hello ladies, don’t be shy and put me in your mouth.” Of course, leave it to me to be the first one to dig in. The flavors were very reminiscent to a Colombian chorizo. The chorizo was completely different to any typical American sausage that most people are accustomed to and nothing like your McDonalds sausage patty. Both of my girlfriends and I are at least part Colombian and we really enjoyed it. The flavor was slightly subtle at first but picked up heat and intensity as you chewed. 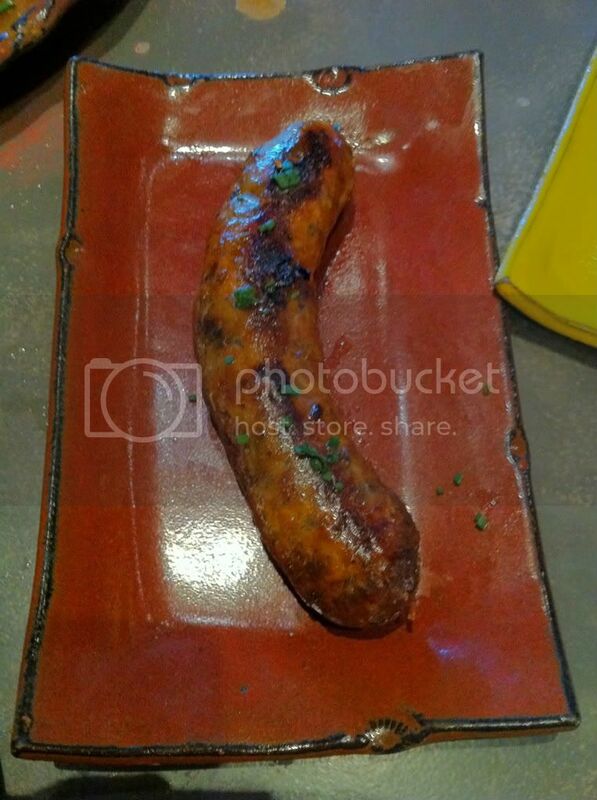 By the time we were done eating it we were left wanting so much more than what we got, much like how some girls feel about the chorizo's phallic look alike. We then moved onto the Truffled Toad in the Hole. 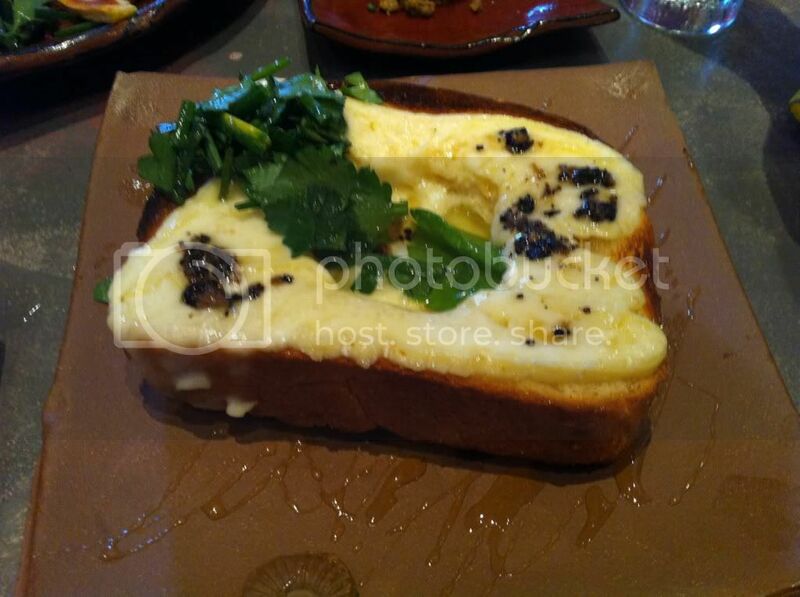 For this dish, Sugarcane used a thick slice of fresh brioche with an organic egg cooked right in the middle then topped with fresh melted Robiola cheese and black truffle. There are very few things (and even people) that I like more than brioche and melted cheese. Again, Sugarcane knocked it out of the park with this innovative twist on an old school dish. The best part of this dish was when you were lucky enough to get a little bit of everything in one bite. The only criticism I do have about this dish is that I felt the egg was a little undercooked for my personal preference. None the less, the flavor of the robiola cheese and the earthy almost nutty flavor of the truffle went perfectly together. This was probably my favorite dish of the day. Lastly we had waffles yet again. We didn’t really plan this well and had a total waffle overload. We went with their Belgian Waffle with bananas, strawberries and nutella. This dish isn’t very original, but it’s great and well executed either way. If we weren’t so full by the time this dish was served, we would’ve eaten every last bite. 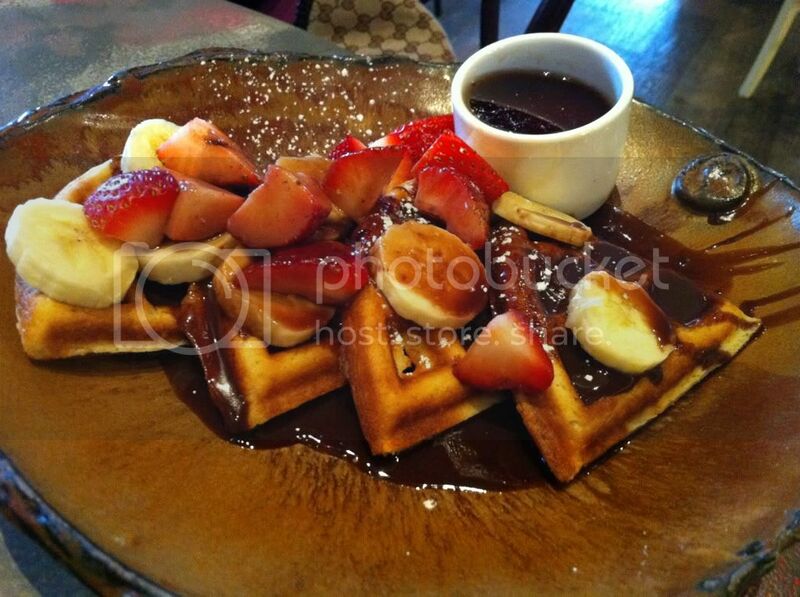 The waffles were fresh and warm; the combination of nutella, strawberries and bananas is ALWAYS a winner. Together they worked wonderfully, if only we hadn’t been so full. 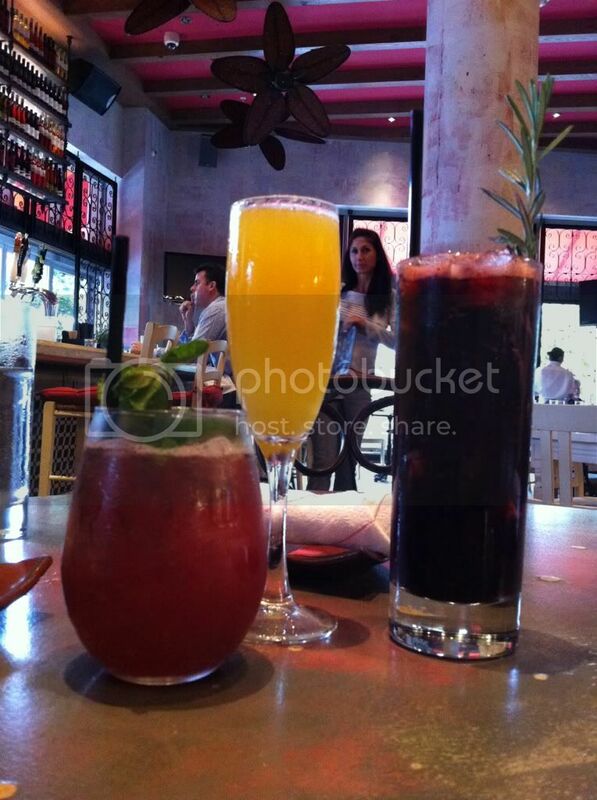 Overall, I truly enjoyed my brunch at Sugarcane. I love the inventiveness of the chefs and bartenders. Several of the brunch items are old school favorites with a new school twist. The drinks were refreshing and interesting. The items are fresh and cooked to order. The items are brought out as they’re ready in no particular order. This is one of the few places that I always recommend when someone is looking for a fun and different place to go to, I’m glad to see that they’re brunch offerings are just as good as their dinner/lunch menu. Plus who doesn’t like starting their day with a full bar? !